Matur Maker is growing out of the shadow of his brother Thon to become a serious talent as well. In the age of mixtape highlight reels for high school players, finding out more information about Matur Maker the individual was difficult. The hours were being spent editing video of his game instead of crafting his words into something that helps the world understand who he is. It’s unfair to take this one piece you are just starting to read and use it as an accurate description of who Matur Maker is. It’s based on about a 10-minute chat with someone who is not really used to the spotlight and a reserved but personable young man who is slowly poking his way out of a pretty large shadow. These words should be seen more as a brief, incomplete introduction to a young talent who according to many people is on the verge of breaking out big time. 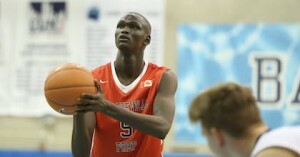 Of course when people hear the name Maker most think automatically of Thon Maker, the highly-touted South Sudanese/Australian who dominated the high school scene in the United States and then moved north of the border and landed at Orangeville Prep and played last season with Kentucky star freshman Jamal Murray. And some of those same people quite likely have heard about Matur Maker, the 1998-born younger brother by about 10 months. But not really much is known about Matur. That led heinnews to Markham, Ontario, on the eastern edges of Toronto for an Athlete Institute Prep high school game against Bill Crothers. Unfortunately, neither Matur nor Thon Maker played in the game. Matur’s been hampered with an injury recently and Thon was kept out because AI Prep has played a number of games recently and both will participate in the Basketball Without Borders Global Camp as part of the NBA All-Star Weekend in Toronto. Still, the trip to Bill Crothers was worthwhile to check in with the Makers and their guardian/coach Edward Smith. Thon is clearly the more out-going and approachable of the brothers with a big smile on his face and a firm handshake. Matur is cordial but still a bit on the reserved side. Matur is told that there’s not much information about him on the internet, especially compared to his brother, who is active on social media. Then Matur is asked, please tell us a little bit about Matur Maker, and he gets right down to, let’s call it, “business”. To the follow-up question “What kind of person are you?”, he offers up: “I’m a nice person.” And then smiles. He does reveal that he really enjoys English class in school and that he likes “working with poems”. And Matur did provide a little about the long journey that took him, Thon and Ed Smith from Australia to the United States and then on to Canada. But it’s clear that basketball is what Matur’s here to talk about. This weekend will be a big one for both Makers at the BWB Global Camp. “I feel really confident. I’ve been really preparing and working on my game, staying sharp and working on my mistakes that I did at the last Basketball Without Borders in the Dominican Republic. I got a lot of feedback from the coaches and I needed to learn from that, and fix a few things up. But I feel ready,” said Matur. The camp will be a great chance for him to learn a lot of things. It will also be a chance for him to get back out on the court as he’s been dealing with injuries, which have kept him from helping his team. Being off the court has given Matur a chance to learn more things from Thon, who is clearly the leader of the AI Prep team. Matur is taking all these pieces and forming his own game – that of a point guard, at 6-foot-10. Gary Payton was a menace on defense, earning the nickname the Glove. Guardian Smith was surprised himself about hearing Matur watches highlights of the “Glove”. “The dynamic thing about Matur is that he can guard four positions on the floor – from one to four. He’s our toughest defender. 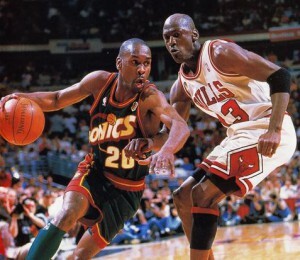 When he said he watches Gary Payton, I didn’t know that. He gets after it. He watches Michael Jordan on defense. He watches a lot of tape about practices. He’s a student of the game. A lot of people will be shocked with how good he is,” said Smith. Matur came out of his reserved shell a bit during the interview, just like he’s building his own reputation on the court – slowly but surely getting out of the shadow of Thon. That shadow will be gone next season when Thon heads to the United States to attend an as-yet undetermined college. And one could definitely get the sense that Matur is waiting for that to happen – even though he knows it will be a challenge. Matur also knows he will get regular updates from Thon at college and will use that to help improve his own game. Which level that exactly is for Matur remains unclear. Smith hinted that Matur might be Europe-bound after finishing his time in Canada rather than college. Matur might well get more international exposure this year as he’s eligible to play for Australia in the 2016 FIBA Oceania U18 Championship – which serves as the qualifier for the 2017 FIBA U19 World Championship. “Regarding Australia, yes, we should have time this summer,” Smith said. Thon was unable to play at the 2015 FIBA U19 World Championship because of school issues – trying to get him ready to possibly go to college. But Smith would love to see Matur play for Australia this and next summer. In the mean time, Matur is happy and satisfied being in Orangeville with AI Prep about an hour north of Toronto. And write poetry about the greatness of Gary Payton.